Codium Labs team is excited today to announce a major update to Offline Kiosk version 1.2. Offline Kiosk is an amazing app that allows you to convert a website into an interactive iPad kiosk which does not need any network connection to work. Offline Kiosk does its magic by downloading all the pages and supporting files from the website and running them locally from device memory. Offline Kiosk supports offline forms, surveys, and all the popular web technologies and tools. In four months since its introduction Offline Kiosk has appeared in hundreds of trade shows and has won mentions in strategic plans of many businesses. It is already instrumental in those industries that often deal with unreliable Wi-Fi networks or spotty cellular coverage, like field service, travel, hospitality, marine, aerospace, and more. Read on for the list of changes in this version. Offline Kiosk works first and foremost with offline pages and forms. But what if your business can’t wait and your kiosks must have a real-time connection to the data source? For these applications we added the ability to run online-only and mixed-mode kiosks. Online-only kiosks, as the name implies, will only work when the iPad is connected to a network. 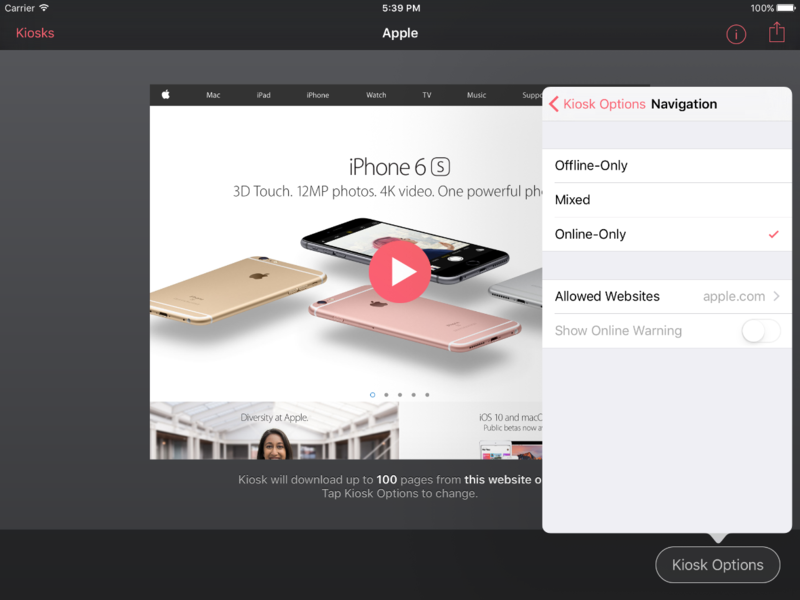 Mixed-mode kiosks can start as regular offline kiosks, then automatically switch to a network connection when they encounter a page that has not been cached in iPad memory. Offline Kiosk allows you to customize the list of websites that a visitor is allowed to browse while using a network connection. You can start creating online and mixed-mode kiosks using menu Kiosk Options > Navigation > Online-Only. Idle Timer feature automatically prepares kiosk to welcome your next visitor when it detects that the iPad hasn’t been touched for a specified time period. It can also erase browser history, cookies, and local storage, and return kiosk browser back to the start page. Idle Timer will even gradually reduce screen brightness to save battery life so that when a new visitor touches the screen, your kiosk is ready for action. Enable Idle Timer in your kiosks using menu Kiosk Options > Browser > Idle Timer. Night Mode feature allows you to create a weekly schedule of time periods when kiosk isn’t used. During these periods, Offline Kiosk will reduce screen brightness to a minimum and use the opportunity to do maintenance tasks like periodic update of your kiosk files. Start scheduling your kiosks using menu Kiosk Options > Browser > Night Mode. 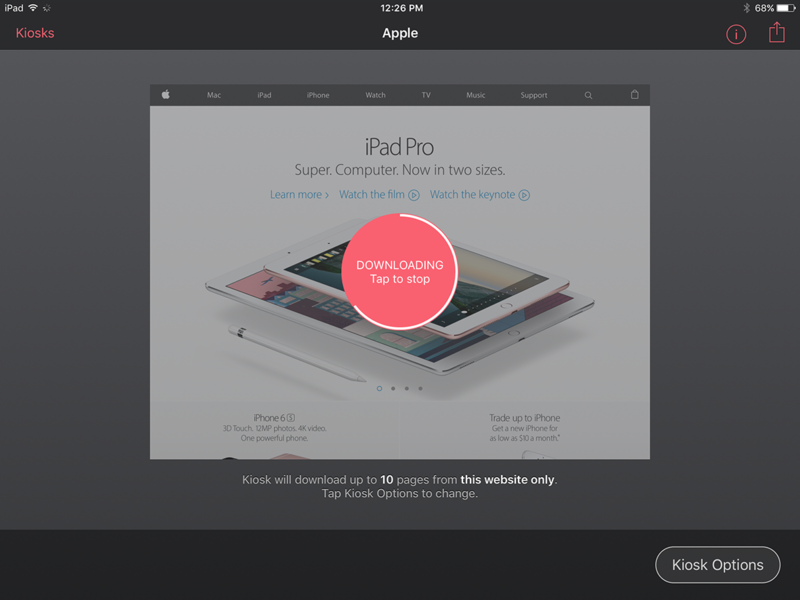 When your kiosk is in Night Mode and the iPad is connected to a network, it will periodically sync with your website and download new content. You can set how often your kiosk will look for updates using menu Kiosk Options > Content > Check for Updates. With version 1.2, Offline Kiosk becomes even more powerful solution for any business kiosk needs. The update is free to all of our current customers. Only thinking about setting up a kiosk? Get Offline Kiosk on the App Store today. Questions? Comments? We’re always open for your feedback.